Home / _Movies / Movies / It's Official: The X-Men and Fantastic Four Are Coming to the Marvel Cinematic Universe! It's Official: The X-Men and Fantastic Four Are Coming to the Marvel Cinematic Universe! At long last Marvel Studios has bought the live-action movie rights to the X-Men and all related characters. Despite rumors that the sale was going through it's still insane that this is happening. Walt Disney this morning announced 21st Century Fox is spinning off Fox Broadcasting network and stations, Fox News, Fox Business, FS1, FS2 and Big Ten Network to its shareholders. The $52.4 billion stock deal includes the X-Men as well as Avatar, The Simpsons, FX Networks and National Geographic. This deal has been a long time coming and a few months back Stan Lee said the studio was "working on" getting the rights back from Fox. In a press release the studio did a slight dig on the Fox movies by pointing out that the deal "provides Disney with the opportunity to reunite the X-Men, Fantastic Four, and Deadpool with the Marvel family under one roof and create richer, more complex worlds of inter-related characters and stories that audiences have shown they love." While it was speculated that Marvel wouldn't be able to acquire the rights to the Fantastic Four and related characters the press release confirms they are included in the Marvel Studios deal. No mention is made of the Fantastic Four rights which have been owned by Constantin Film since 1983. Constantin AG is a German film production and film distribution company, based in Munich, Germany. ScreenRant broke down how the deal went down in an excellent post about this deal. In 1983, German producer Bernd Eichinger met [Stan] Lee and eventually agreed to option (not purchase) the Fantastic Four and Silver Surfer’s film rights (read: production rights) for $250,000 in 1986, and he would keep the rights so long as a movie for either property entered production by end of 1992. At this point, the only studio holding out on the Marvel movie rights is Universal which has sole distribution rights to a solo Hulk movie and a few other characters. Marvel cut a deal with Sony to use Spider-Man and some Spider-Man characters but Sony is still producing movies based on Spider-Man characters like Venom and the Silver Sable/Black Cat team-up movie Silver & Black. The deal still needs to be approved by the Department of Justice which is planning to block the sale of AT&T’s proposed merger with Time Warner so we'll see. 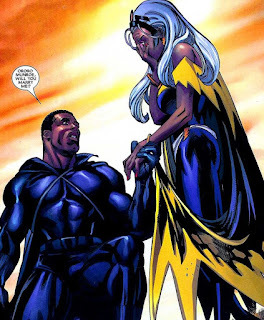 Besides the obvious fact that the X-Men are returning it also sets up the wonderful marriage of Black Panther to X-Men member Storm. Will there be wedding bells in Black Panther 2? Are you excited for the X-Men to be in the MCU?